How do you create Website, Ftp server, Video, Mail server ,if no static IP? 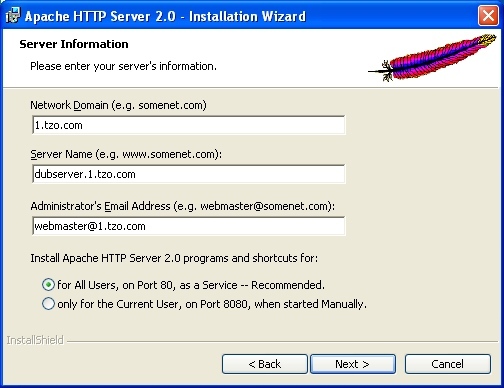 Many DNS2P users want to run their own web server with multiple web sites on their home server. Using Microsoft IIS can be a big issue with worms and viruses, and sometimes the DNS2P Windows web server can't perform some of the advanced tasks that Apache can. Since Apache is the world's leading web server, we get plenty of inquiries about running the Apache Web server on both Windows and Linux. Apache 2.0 is a recent release of the world's best web server, and due to many improvements, we wanted to bring you a tutorial on configuring the Apache server to run your domain(s). In this tutorial, we have the DNS2P Windows software running on our server, and have added the domains 1.dns2p.com, 2.dns2p.com, and 3.dns2p.com. Once we get everything tested with these DNS2P subdomains, we can purchase additional private domains from DNS2P and add them into our server later once everything is working. Our Linksys NAT router has a LAN address of 10.1.1.254 and the routers WAN IP address is Dynamic, so it could change anytime. 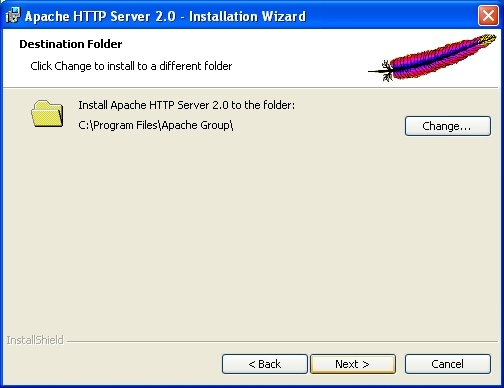 The first thing we need to do is download and install the Apache 2.0 server for Windows. Install the server by clicking on the MSI file. Install the Apache server to the default path of C:\Program Files\Apache Group as shown in the shot below. Once the Server is installed you will see the Apache server monitor in the System tray near the clock as shown. 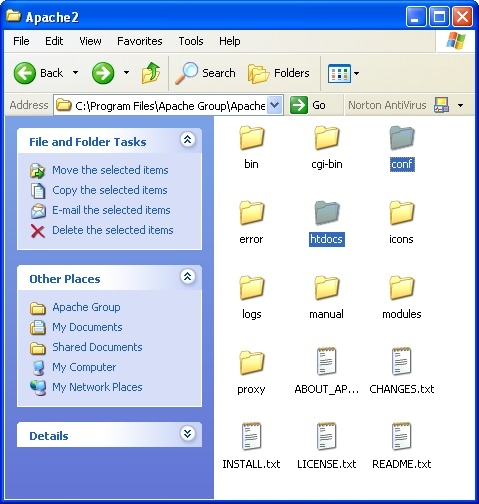 The Apache Monitor icon is to the far left, the feather with the play button in the middle. When the server is stopped, the symbol changes to a red stop button. Scroll down to the bottom of the httpd.conf file and find the section with "NameVirtualHost" as shown below for virtual hosts. By Default, Name based virtual hosts are turned off and we need to turn them on and add in our virtual hosts, then restart the server. Apache loads the .CONF file configuration every time the server is started or restarted, so once we save this file and restart, our changes should be in-place.